When the Smoky Mountains became a national park in the 1920s, the people living within the boundries of the park were forced to sell. They were allowed lifetime tenancies, but since farming and logging were restricted, many had no way of making a living if they remained. So off they went. The park service moved some of the more historic buildings to an area outside of the town of Cherokee, about 60 miles west of Asheville. Mountain Farm Museum is a collection of historic buildings taken from throughout the Smoky Mountains, most built in the late 1800s. The John Davis House, below, is a rare look at a house made of American Chestnut. It was built in 1899, before a blight in the 1930s and 40s killed most of the American Chestnut population. The buldings — a house, barn, corn crib, smoke house, hen house, apple house, spring house — are close together and wandering through won’t take more than 45 minutes, even if you looked at and read absolutely everything. It might take a little more time during tourist season, when it becomes a working farm with interpreters, farm animals, crops, and demonstrations. We were there during off-season and it was almost empty. If you’re a walker or a hiker, there are two 1.5 mile paths that start at the farm. One is a level walk along the Oconaluftee River into Cherokee and the second is a steeper climb up into the mountains. Mountain Farm Museum sits next to the Oconaluftee Visitors Center, a large and recently renovated center that has almost every piece of information needed to tour the Great Smoky Mountains. 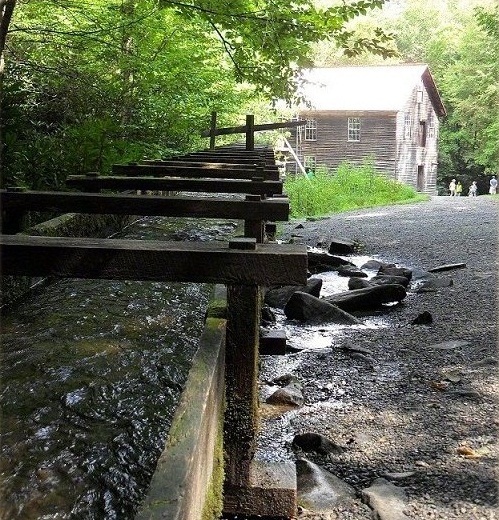 After the farm, we went north about a half mile to Mingus Mill, a grist mill built in 1886. It’s just the mill. We walked up to the stream that feeds the flume, took a few pictures, took a quick peek at the milling information inside, and were on our way. Thirty minutes max. Some of the communities that were emptied when the park service bought them still stand as they were when their people left them. The buildings have been preserved by the National Park Service for anthropological study and tourism. 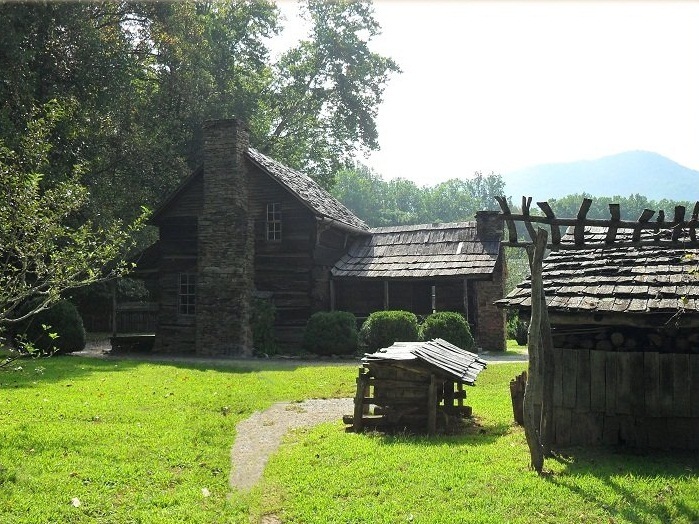 There are over 90 historic buildings standing in Great Smoky Mountain National Park. You can take a driving (or biking) tour through the ghost communities of Cataloochee, Roaring Fork, and Cades Cove, which have homesteads, churches, and other buildings open to the public. Cataloochee, in particular, was an active community into the 1940s, and many of its buildings are modern. I’ve never been but I’ve heard that it’s got an eerie Left Behind feeling — that people disappeared unexpectedly and the town remains exactly as it was the moment they left. Getting to Cherokee and the Mountain Farm Museum meant about an hour and a half up and down long, winding mountain roads from Asheville. Bring Dramamine. It is, however, easier to get there than to Cataloochee, Roaring Fork, or Cades Cove. The park service didn’t have the money to finish roads into the holler, so those trips involve narrow, winding gravel roads that aren’t always open. And not all vehicles are allowed on the roads: no RVs, buses, or trailers. Check the National Park Service website for hours and restrictions. Each has a visitors center or ranger station and you can pick up an auto tour brochure at any of them. I hear that Cades Cove and Roaring Fork are popular and driving the tour loop through them is like driving the DC beltway during rush hour. Go to Cataloochee for a little less bumper-to-bumper. Gallery | This entry was posted in North Carolina and tagged historic farm, historic house, history, Smoky Mountains, travel, vacation. Bookmark the permalink. It was amazingly beautiful. I wish I’d had more time there. Thanks for your visit. Love your blog! Somehow I completely missed the part where people were virtually forced off their land in order to create the park! Great way to honor the local culture. Quilter! I know what you mean. I must admit I always assumed that people just faded away, out of the national parks.